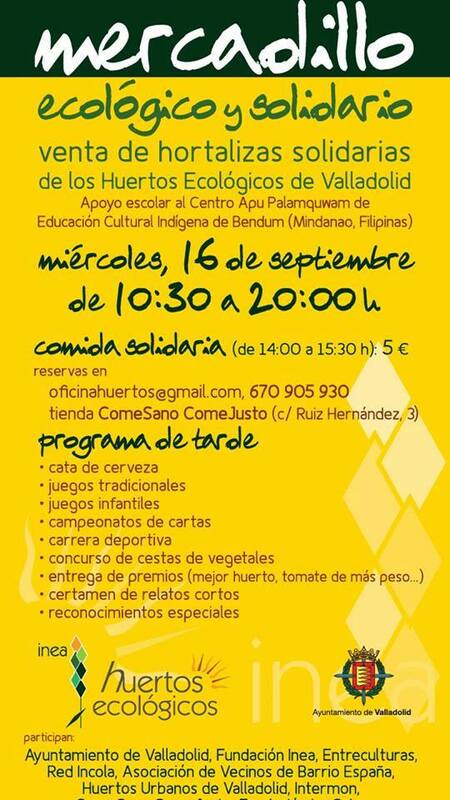 The University School of Agricultural Engineering (INEA in Spanish) in Valladolid, Spain held its latest edition of the Ecological and Solidarity Market last 16 September jointly with growers of organic gardens, a green project that the community has looked forward to since 10 years ago. In the past, the event has generated around 30,000 euros to donate to organizations in Honduras, Congo, and Mozambique to assist in the development of curricula and educational materials. On this occasion, the funds raised were donated to the Apu Palamguwan Cultural Education Center (APC) in Bendum in northern Mindanao, Philippines that provides Kinder to Grade 6 classes for about 300 students. APC has been operating an upland elementary school for the Pulangiyen indigenous communities for more than 10 years. And for this school year, APC offered Grade 7 classes and around 30 students are currently enrolled. The Bendum Culture and Ecology Centre runs the accompanying skills trainings and formative sessions for the young adults and provides indigenous youth practical lessons and on-site activities in the environmental management of their landscapes and livelihood.